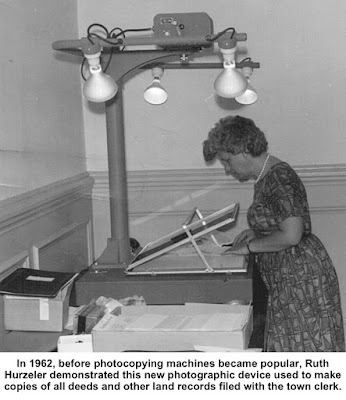 One of the town’s most important jobs is that of the town clerk, the person who records and preserves all of Ridgefield’s important data and documents. The town clerk’s office is the official repository of the records of births, marriages, deaths, and burials; the countless documents that deal with the land and its ownership such as warrantee deeds, mortgages, liens, and releases, as well survey maps; and the minutes of all meetings of every board and commission. The town clerk supervises elections and send the results of the secretary of the state; distributes and receives absentee ballots; posts notices of government meetings; and maintains records of all town ordinances, regulations and charters. All town officials are sworn in by the town clerk or the clerk’s assistants. The town clerk can swear you in as a new voter, issue you a marriage license, and sell you a license to fish, hunt or trap. If you’re a dog, the town clerk will sell your owner a tag. The first town clerk was John Copp, who had also laid out the village settlement and was Ridgefield’s first teacher. And for more than 230 years, every single one of the 18 people who succeeded him as town clerk was a man. Then along came Ruth Hurzeler, and ever since, every town clerk has been female. It was one of the first traditionally male offices to be won by a woman. Ruth Mildred Hurzeler was born in Bethel in 1917, a daughter of Swiss-German parents — Rudolph and Pauline Hurzeler — who operated the Ridgefield Bakery in the space now occupied by Planet Pizza (and long the home of Roma Pizzeria). nomination without difficulty and in the October 1949 election (municipal elections were a month earlier than state and national elections back then), she handily defeated Democrat Susan C. Duncan, 999 to 586. 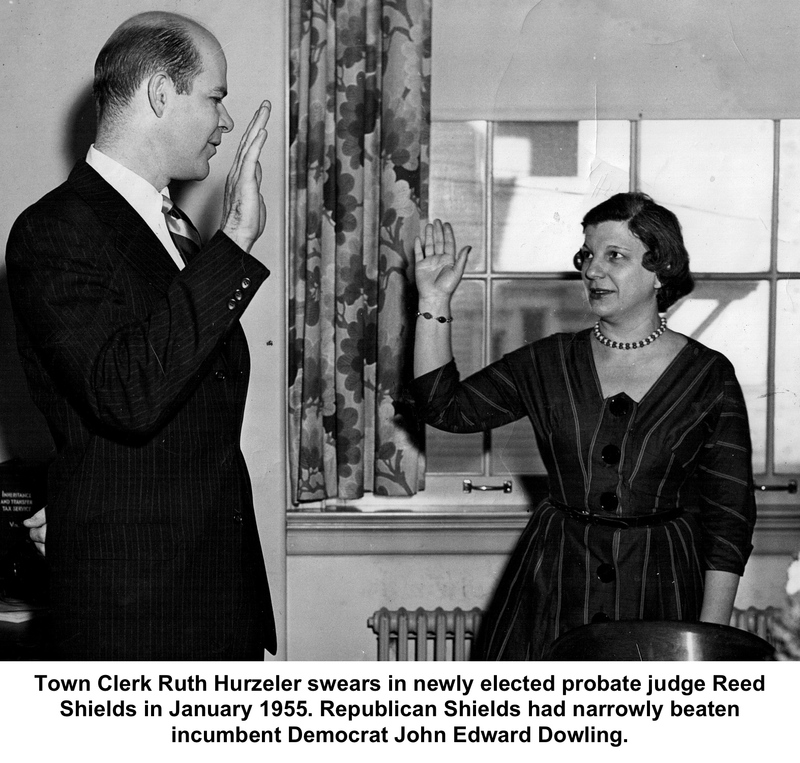 She won the seat even though the top of the ticket was taken by a Democrat, Harry E. Hull, who received almost the same plurality for first selectman as Hurzeler did for town clerk. Two years later, she defeated soon-to-be Postmaster Richard E. Venus (who later became town historian) by the wide margin of 1,157 to 662. She went on to win every biennial election until the early 1970s when one of the great campaign battles of 20th Century Ridgefield was waged. A young woman named Terry Leary decided to take on the seemingly entrenched Hurzeler in the 1971 election. Leary came close, amassing 2,239 votes to Hurzeler’s 2,461. Although Leary lost, the Democratic party saw the potential for a victory in two years. In 1973, she ran again, making the town clerk’s salary her major campaign theme — a theme that appealed to both Democrats and some fiscal-minded Republicans and unaffiliateds. 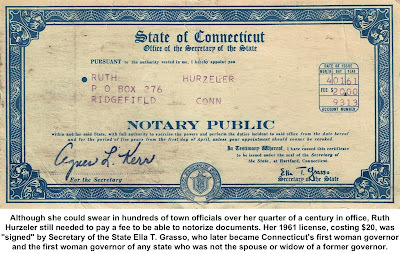 For centuries, town clerks had been compensated by the state-defined fees they charged people who were filing documents, particularly deeds and mortgages. In the 18th, 19th and early 20th Centuries, that usually didn’t amount to much, since relatively few land transfers took place. 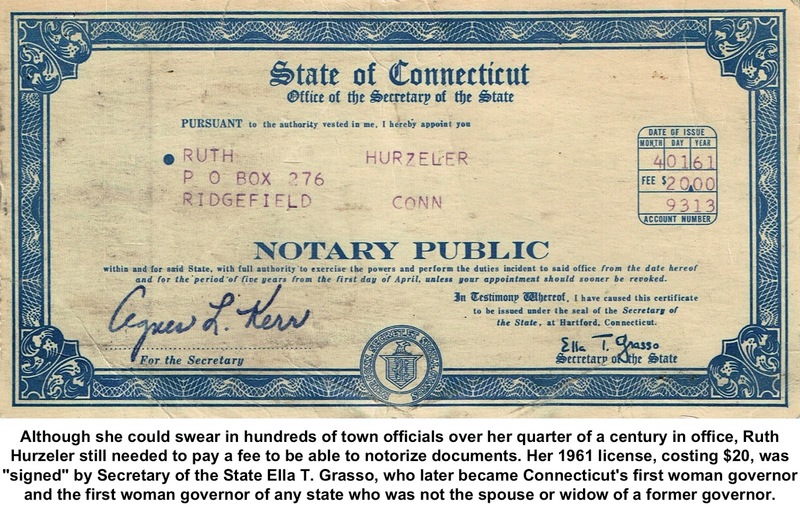 But when the Ridgefield building boom began in the 1950s, thousands of warrantee deeds, mortgage deeds, and many other land-related documents were being filed — and the income of the town clerk increased manifold. business, and she maintained that it was the age-old, statutory, and fair way to compensate the job. However, she said in 1972 she would be willing to be salaried, if the salary properly compensated all the work the job required. She said she did as much as a first selectman, and that job was paying $20,000 at the time (equivalent to about $116,000 in 2017 dollars). In 1973, which would have been Hurzeler’s 13th term in office, she lost the election to Leary, who prevailed by a sizable margin, 3,350 to 2,812 — probably helped a bit by riding the coattails of Louis J. Fossi, a popular Democrat who won a landslide victory for first selectman. But clearly the salary issue was important, and Leary immediately asked the Board of Selectmen to propose that the office be salaried. The voters eventually agreed. Hurzeler maintained the day after the election that she would run again in two years, but ill health prevented her from doing so. She remained an influential member of her party, and was vice-chairman of the Republican Town Committee when she died in 1977 at the age of 60. At a her retirement party in January 1974, newly elected First Selectman Fossi praised her years of hard work. “No one in Ridgefield … does not appreciate the efforts and quality of your work and your dedication over the years,” he said, adding that she would now have time to relax, enjoy life and travel. The nation was in the midst of the first great “oil crisis,” thanks to an OPEC embargo sparked by the Yom Kippur War.